AZ Locksmith offers affordable Garage door lock repair service! Garage doors are closed and opened regularly and may get damaged because of their heavy weight. Furthermore, over time these locks become rusty, which may attract potential thieves or burglars because such locks can be easy to open. Nowadays, many homeowners keep their valuable possessions in the garage. They are also frequently used in commercial places in terms of storage. Whether it is residential or commercial, if your garage door lock needs repair, we advise you to fix it immediately due to the high value of items kept inside the garage. We understand the importance of garage door lock repair as soon as possible. This is why we offer quick repair services, which means that after calling us, our professional locksmiths will come to you as fast as they can 24 hours a day. Because our locksmiths have vehicles equipped with all the proper hardware to repair your garage door locks, we are able to do the repair on site quickly and efficiently. 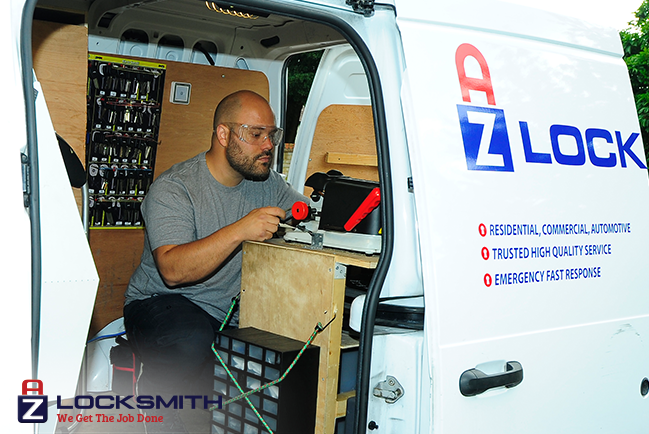 AZ Locksmith security experts use only high-quality products and parts covered by a 1-year warranty. Moreover, we offer affordable and fixed prices and we don't charge any extra fees. Sometimes, it’s better to replace the entire lock instead of repairing it. For example, if you have lost a key, or if you need a security upgrade, we recommend you to do a full replacement of your lock. Please call us and our security experts will determine which option is the most efficient for the security of your home or business.